We set up online shops and integrate connected payment systems, so that businesses can expand their reach. Let’s not sugarcoat this. If you are selling goods or software and are not selling online, your growth could be significantly reduced and your business could even be threatened at some point. If your business is not facing an existential threat, e-commerce is a great way to increase sales, brand awareness, customer engagement, and your geographic base. Online shopping is a powerful and easy way to precisely quantify what attracts the interest of shoppers. You can see in real time which product page is visited the most, which gets the most conversion, etc. This enables you to clearly identify which items to push more, less, and where you should work to improve conversion. E-commerce platforms can be connected to accounting, inventory management, and other systems, which lead to increased efficiency and cost savings. If you are selling in physical locations or manage transactions on the road with salespeople or dispatch services, using solid e-commerce tools makes the experience much smoother for both the customer and the seller. Why work with SOLJIT for e-commerce? 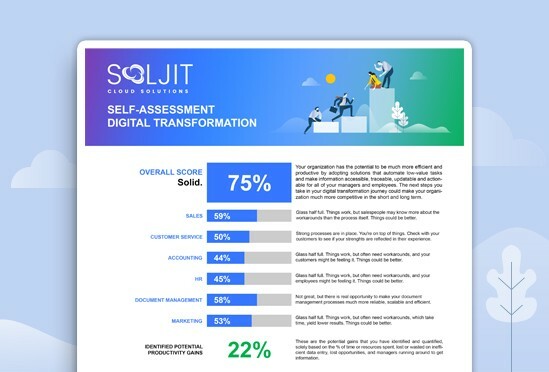 By far, the best reason to work with SOLJIT is that we want your business to be successful now and in the long term. SOLJIT has used multiple e-commerce platforms over the years, including WooCommerce, Shopify, Square, Stripe and Praxedo. With this experience, we can recommend you the one that is best suited to your needs. Having brought many successful projects to completion, we have significant experience in the integration of different e-commerce tools, as well as with 3rd party applications, such as Salesforce (for sales) and Sage (for accounting and finance). We have the necessary skills to leverage these applications so that information is shared, which then reduces or eliminates the amount of work related to importing or entering data in different systems manually. Although most of our projects are full implementations, our service packages are flexible and include time blocks, which can be used for support or for the continuous improvement of your systems. Quickstart packages are designed to get you up and running with a standard implementation rapidly. Although these packages are limited in options, they do include business analysis, project management, some customization, basic dashboards, data import and training. Using agile development, our teams can tackle highly customized projects, including the development of plug-ins, mobile apps, and more. Start selling today with the world’s most customizable e-commerce platform. Your store, your way. WooCommerce is an open-source, completely customizable e-commerce platform for entrepreneurs worldwide. Whether you sell online, on social media, in-store, or out of the trunk of your car, Shopify has you covered. Selling your products in many places should be every bit as simple as selling in one. With Shopify’s e-commerce software, you get one unified platform to run your business with ease. Start selling fast. Know what you pay and get paid. We make card processing simple. Accept Visa, MasterCard, American Express and INTERAC Flash® with clear pricing and no surprise fees. See deposits in your bank account as soon as the next working day. Stripe builds the most powerful and flexible tools for internet commerce. Whether you’re creating a subscription service, an on-demand marketplace, an e-commerce store, or a crowdfunding platform, Stripe’s meticulously designed APIs and unmatched functionality help you create the best possible product for your users. Praxedo is a proven, cloud-based field service software developed by FSM specialists that meets the requirements of small, medium, and large businesses. Our easy-to-use, real-time communication tools enable your dispatchers, field staff and administrators to be more productive while improving customer satisfaction.